It’s reported that total number of iPods sold worldwide was 350 million as of September 2012, according to Apple Inc. The iPod did prove its popularity around the world, all attributing to its powerful storage capability and multirole as portable media player, WIFI mobile platform, etc, no wonder people want to morph iPod into a movie player for watching movies on the move. But for DVD owners, inevitable problems follow. As is mentioned above, a free DVD to iPod ripper can help you cope with format restriction. However, DVDs are classified into noncommercial DVDs and commercial DVDs with copy protection schemes that thwart the DVD ripping process. So here I’ll introduces two programs respectively to rip DVD to iPod free of charge, covering both unencrypted DVDs and copy protected DVDs. they are Handbrake and MacX DVD Ripper Mac Free Edition. No.1 free DVD ripper software for iPod to convert protected DVD to MP4, MOV that iPod, iPhone iPad Android accepts with no quality loss. 100% safe with no virus, malware or plugin. If you happen to have a DVD that is not encoded with copy protection measures, Handbrake can be the best choice. As an open-source DVD ripper, Handbrake enables to free convert DVD to iPod seamlessly. For more details about how to use Handbrake to rip DVD, you can visit Handbrake tutorial. Note: Most of the time, Handbrake has trouble reading a disc, it is because of copy protection, which means that you can't rip popular DVD movies to iPod. Therefore, you can rely on a DVD ripper with DVD decryption ability as follows. When you reach this section, it means that your DVD is copy protected or encrypted by DVD copy protection technologies. To liberate your movie content out of protected DVD and import DVD to iPod Touch, iPod Nano, iPod Classic etc, MacX DVD Ripper Mac Free Edition brings your DVD movie to life. It helps you rip DVD movies, regardless of CSS, region code, Sony ARccOS, Disney copy protection, etc encoded on your DVD, thus making DVD to iPod conversion all at your fingertips. Below are the simple clicks to finish the conversion. Download and install the free iPod DVD converter on Mac OS, click "DVD Disc" button on the upper left part to load DVD file or hit "Path" button to load DVD folder. Hence, input the number 1280 and 720 respectively for the W:H (Width:Height) for the video resolution. After finishing the above steps, hit the "Start" button and start to free convert DVD to iPod on Mac OS X. Both Handbrake and MacX DVD Ripper Mac Free Edition has limited format supported. To be specific, the former enables you to rip only homemade DVD to MP4, and MKV while the latter helps to free rip not only common DVD but also encrypted DVD to MP4, iTunes, MOV, FLV for further playback. But if you have higher demand on DVD copy and ripping, please head over to the advanced version MacX DVD Ripper Pro, which provides more output formats including iPod Touch, iPod Nano, iPod Classic, iPhone 6s/6s plus, iPad Mini 4, iPad Pro, Samsung Galaxy Note 5 , etc, thus making your DVD movies playable on almost all gadgets with lossless video quality. 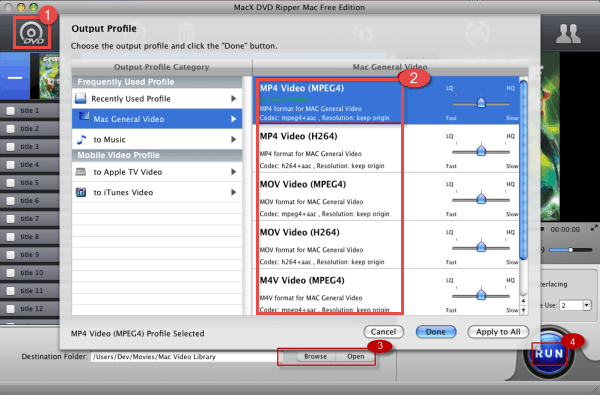 This guide will show you how to convert and import DVD movies to MP4, MOV and M4V that iPod Touch 4 supports on Mac OS. MacX DVD Ripper Mac Free Edition, as a powerful yet 100% freeware, can free rip DVD to iPod compatible video format with high quality. This free DVD converter software for Mac to free rip DVD to MOV, MP4, MPEG, FLV that compatible with iPhone, iPod, iPad, etc. Download the free DVD converter software Mac for free.